Late March, when the first, tender (and, therefore, vulnerable) shoots appear on local grape vines, is also when central coast grape growers pay (even closer) atention to the themometer. Spring's annual miracle -- the "bud break" -- is nervous time in local vineyards, due to San Luis Obispo County's annoying little habit of seeing a hard freeze, late in the season. Last year, one, quick, two-day freeze in May, when tiny, and vulnerable, grape bunches had already appeared on the vine, would turn many of those tiny grape bunches brown. Curt Schalchlin, who gets most of his grapes from the Santa Rita Hills near Lompoc and Westside Paso Robles, said he’s heard some growers are 40 percent short of their estimated yield. “It probably has a lot to do with the early (spring) frost — the plants kind of had to regroup,” said Schalchlin. For the next couple months (until the danger of frost is past... hopefully! 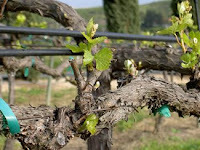 ), SLO County Wineries News will keep an eye on the local weather, and report in upcoming newsletters on any frost episodes that occur in the spring of 2009... should be interesting to watch. The impact that one, quick, late frost can have on an entire vintage, months later, is dramatic. Our urban winery’s location does not allow me to have a hands on monitoring of what goes on in the vineyard on a day to day basis. I do know that right now is an exciting time for growers as spring is near and bud break is just around the corner. Perennial plants (such as grapevines) bloom and mature over spring and summer then go dormant every autumn and winter after harvest. Spring marks the first emergence of the shoots that will grow to bear grapes by September. This can be a nerve racking time for winemakers whose first thought on very cold nights in spring is frost damage. Once bud break occurs, the flowerings are vulnerable to frost damage. "To prevent frost damage to the tender, new shoots, mow grass cover crops between the vines, leaving a "blanket" on the ground." "If the nighttime temperatures threaten to drop below freezing, some vineyards workers spend the night tending to overhead sprinklers. As the water emitted by the sprinklers freezes and thaws, heat is created. The ice that forms around the buds serves to insulate and protect them." J. Lohr Vineyards & Wines unveiled the largest solar tracking array in the North American wine industry on Wednesday at its Paso Robles winery. "With numerous sunny days, Paso Robles isn't just ideal for producing rich and flavorful Bordeaux and Rhône-style wines," said Steve Lohr, senior vice president of planning and development with J. Lohr. "It is also perfect for producing clean, renewable energy." "Owning our own solar tracking array is another important step in our commitment to environmentally-conscious practices," said Lohr. "In our own way, we are working to protect the very climate that nurtures our grapes, while contributing to efforts that reduce the need for drilling off our spectacular coast," he said. The energy generated from J. Lohr's system will reduce emissions of the greenhouse gas carbon dioxide by 29,887 tons over 25 years, the company estimates. Tracking solar array is planted amidst the grape vines at J. Lohr's Paso Robles winery. The new solar array is part of the company's broader program of sustainable winegrowing and winemaking techniques. Lohr uses organic soil amendments, limits its use of chemicals, controls erosion, conserves water, and practices composting and materials recycling. Allison Jordan, executive director for the California Sustainable Winegrowing Alliance, said the company is helping the entire California wine industry to make operations easier on the environment. "J. Lohr has an impressive track record of environmental responsibility, and by both adopting sustainable practices and being willing to share its experience with others, is helping to expand the California wine industry's widespread sustainability movement," she said. The tracking solar system was designed and installed by Conergy, which is involved in one in 10 of the world's solar photovoltaic projects. "By investing in this bellwether system, J. Lohr becomes more energy independent and will enjoy more predictable energy costs for decades to come," he said. Founded more than 30 years ago by Jerry Lohr, J. Lohr Vineyards & Wines operates 3,000 acres of estate vineyards in Paso Robles, Monterey County, and the Napa Valley. Join graperadio.com in their podcast of a seminar held February 23rd, 2009, during the Paso Robles chapter’s 2nd annual Paso Robles Rhone Rangers Experience. Click here to listen to this interesting podcast. One commenter that had listened to the show wrote, "As an amateur winemaker, the information on a panel discussion like this is invaluable. I’ve given it 3 listens already and need to write down notes for this coming harvest." What constitutes a Rhône varietal wine? Well, 75% of the wine’s content must include one or more of the traditional Rhône grape varieties as approved by the French government for the wines of the Côtes du Rhône. In France’s Rhône Valley, there are 22 grape varieties including the better-known Syrah and Viognier, to the “up and coming” Mourvèdre, Grenache, and Roussanne, to the obscure Counoise, Bourboulenc and Picpoul. The San Diego Union Tribune has put together a fun, and extensive "Question and Answer" page on their web site, as part of their Wine Guide. And when we say "extensive," we mean extensive. Question: Which wines go with spicy Mexican food? A four ounce serving of dry white wine has about 104 calories, and a four ounce serving of red wine has about 110 calories. Sweeter wines contain more calories depending on how sweet they are, and Port, Sherry and other fortified wines have more calories because of higher alcohol levels. Four ounces is 1/2 cup and when poured into a nice, big wine glass, it looks like barely a sip. When I am watching my weight, I use a smaller wine glass. Sigh. Question: What is "bud break"? Answer:Bud break is when new green shoots and tender green leaves appear on the vines after a season of dormancy. In the northern hemisphere, this usually occurs in March or April. In the southern hemisphere, bud break usually occurs in September or October. Late frost can seriously damage a vintage once the vines have emerged from dormancy and bud break has occurred. Question: How does rain affect the harvest? Answer: A little bit of rain (a day or two) doesn’t really hurt anything, other than lowering the brix (sugar content) of the grapes. A couple of sunny days after that will raise the brix back up. More than a couple of days of rain during harvest can be a bad, bad thing though, because the grapes may start to mold. One harvest here in Sonoma County (I think it was 1998), it rained so hard and the vineyards got so muddy that we couldn’t get the tractors out to pick the grapes. Consequently, about half of our grape crop was lost. Glamorous as it may seem, the wine industry is based on farming. Finally, as SLO County Wineries News mentioned last month, the Paso Robles Zinfandel Festival happens later this month. Friday: Come celebrate with us Jada's first Zinfandel Festival weekend. We're releasing our 2006 vintage and they're tasting yummy! Cheese pairing to complement our wine, plus chocolates galore! Enjoy barrel samples too! Saturday: Big Chili Cook-Off all weekend! Different styles of chili paired with Jada wines for your tasting pleasure. Vote for your favorite chili. Enjoy special barrel samples. Tours offered. Reservations required. Sunday: The Big Chili Cook-Off continues with cheese and wine pairings to boot! Barrel samples offered and tours by reservation. Come enjoy our wines, ambience, great customer service and beautiful views.